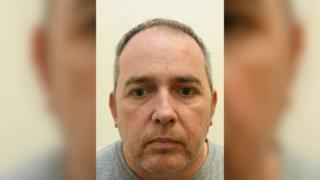 A man has been jailed for life after he was found guilty of murdering his former partner. Clarissa-Charlene Faith, 26, was found dead by police after they were called to her home at Bracken Way in Harworth, Nottinghamshire, last July. Stuart Hall, also of Bracken Way, had denied murder during a trial at Nottingham Crown Court, but was found guilty by a jury on Thursday. The 48-year-old must serve a minimum term of 14 years. Nottinghamshire Police said Hall strangled Mrs Faith following an argument. Image caption Clarissa-Charlene Faith's family said Hall's actions had "created a nightmare"
After the sentencing, Mrs Faith's family said: "Clarissa is now only memories to those of us that knew and loved her. "Hopefully we will be allowed to pass those memories to Clarissa's daughter, our granddaughter, as she grows. "Stuart Hall created a nightmare for our family, the effects of which will ripple through our lives forever."